Oriental genre painting was created by Czech landscape and genre painter Otakar Cila, born 1894 in Nove Pace (Czech Republik). 1913-1914, then 1920-1925 he studied at the Prague Art Academy. 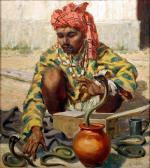 After his study the painter travelled and worked in India, Albania and on the Near East. He worked and exhibited in Prague. 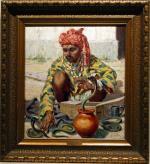 EXHIBITIONS: 1936 Trencianske Teplice: Themes from China and India. Literature : Prof.Toman"Dictionary of Czech artists"(in Czech), Praque, 1960; Vollmer; Saur. Technique: oil on cardboard. Original period frame.